The Il-112V light military transport aircraft is being developed by JSC Ilyushin Aviation Complex. Image: courtesy of Allocer. The Il-112V airlifter was exhibited at the Aero India 2015 defence exhibition. Image: courtesy of Open Joint Stock Company "Ilyushin Aviation Complex". The first Il-112V prototype is expected to perform maiden flight in 2016. Image: courtesy of Open Joint Stock Company "Ilyushin Aviation Complex". Il-112V is a twin-engine light military transport aircraft being developed by JSC Ilyushin Aviation Complex, a part of JSC United Aircraft Corporation (UAC), for the Ministry of Defence of the Russian Federation. It is set to replace the An-26 and An-72/74 twin-engine transport aircraft. The Il-112V aircraft can be used for the transportation and airdropping of military personnel, light weapons and equipment, vehicles, and a variety of cargo. Il-112T, the civilian transport version of Il-112V, is designed for commercial cargo transportation services. Two Il-112V prototypes, including one for static and fatigue tests and the other for flight tests, will be built initially. Construction and maiden flight of the prototypes is scheduled for completion in 2016. The first production aircraft is expected to be delivered in 2018. A model aircraft of the Il-112V was exhibited at the Aero India 2015 air show held in Bangalore in February 2015. The A400M (formerly known as the future large aircraft) is a military transporter designed to meet the requirements of the air forces of Belgium, France, Germany, Spain, Turkey and the UK. JSC Ilyushin Aviation Complex was selected to develop the airlifter in May 2003, but the manufacturing of the first prototype was halted due to design flaws in 2011. The Russian Ministry of Defence unveiled plans to award a RUB7.9bn ($240m) contract for the development of the Il-112V in December 2013. The development was resumed in December 2014 when Ilyushin concluded a contract with the Russian Defence Ministry to carry out engineering and development work of the Il-112V. 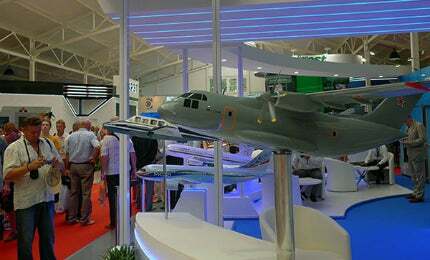 A state contract for the supply of Il-112V production aircraft is expected to be signed in 2015. The development and production of Il-112V will involve participation of 30 Russian enterprises and more than 50 aircraft component suppliers. The aircraft will be manufactured by JSC Voronezh Aircraft Manufacturing Company (VASO), while JSC Klimov will supply the engine. Aviastar-SP will provide fuselage panels and other airframe components, while Russian aircraft equipment supplier JSC Aviaagregat will develop a new retractable tricycle landing gear for the airlifter. The Il-112V light military transport aircraft features classic high-wing monoplane design with constant chord inner wings and tapered outer wings. The circular fuselage is designed to withstand heavy loads. "The Il-112V aircraft can be used for the transportation and airdropping of military personnel, light weapons and equipment, vehicles, and a variety of cargo." A T-tail configuration, which consists of a vertical stabiliser and a rudder, attaches the fuselage. The retractable tricycle landing gear will include a nose wheel unit and two main wheel units. The aircraft can be operated from short / unpaved runways and can be automatically land on ICAO category II aerodromes. It can be manually land on poorly equipped aerodromes, or aerodromes without radio technical equipment. A crew of two personnel can operate the airlifter. It has a maximum take-off weight of up to 20t, and payload capacity of 6t. The cargo cabin is attached with a loading ramp for loading and unloading of cargo, while the cabin is 11.2m long, 2.45m wide, and up to 2.4m high. The aircraft is designed to carry out both transport and airlift missions under any geographic, climatic, and adverse weather conditions, during day and night. A glass cockpit features on the light military transport aircraft, as does an advanced digital avionics suite incorporating navigation equipment, communications, flight displays and monitoring systems. The Il-112V will be powered by two Klimov TV7-117S / TV7-117SE modular turboprop engines, which generate a maximum take-off power of 2,800hp each. The engine is 2.14m long and 0.94m in diameter, and weighs 450kg, while the propulsion system consists of two six-bladed propellers. Speeds ranging between 550km/h and 580km/h can be attained by the airlifter. It will have a maximum operational range of 6,000km flying at an altitude of 8,100m.